Troyes is one of France’s gems and relatively unknown. It's a well-preserved medieval town with old streets of restored half-timbered houses, their different façades creating a delightful patchwork of colours. It was the former capital of the Champagne region and is still the capital of Aube, the department that is part of Champagne lying to the south of the better known cities of Epernay and Reims. Troyes is compact so it’s a good city to visit without a car. It’s easy to get to from Paris and the main sites are all within the small historic center. By train: Pairs Est to Troyes direct takes around an hour and a half. By car: Paris to Troyes is around 170 kms (105 miles). Take the N19, then the E54; exit at junction 21 for the A56 direction Fontainebleau then very quickly take the A5/E54 signposted to Troyes. Take the signs to Troyes center. There’s plenty to see in the central area of Troyes, a city which became a vital part of the great trade route between Italy and the cities of Flanders in the Middle Ages. This was the age when the town hosted two vital annual fairs, each of which lasted for three months and brought craftsmen and merchants from all over Europe to increase the coffers of the merchants and the town's grandees. A fire in 1524 destroyed much of the city which by this period was a center for hosiery and cloth making. But the city was wealthy and houses and churches were soon rebuilt in the bang up-to-date Renaissance style. Much of what you see today comes from the 16th and 17th centuries. Today Troyes boasts 10 churches, winding cobbled streets, a cathedral and some excellent museums. And it's known for its magnificent stained glass, so bring binoculars when you visit to catch the glorious details high up in the windows of the churches and cathedral. Troyes is famous for its huge discount and factory shopping malls just outside the center, all of which are easy to reach. It's also a good place for food shopping, either in the covered Marché les Halles or in specialist shops around the town. In the summer, Troyes organizes Ville en lumières spectacles from mid July to mid August. It’s a free show on Fridays, Saturdays and Sundays starting around 9.30pm. You gather in the Garden of the old Hôtel de Ville for a staged light and sound show. Then, according to the theme, you're guided through the town by costumed characters to different spots where again, light plays across a particular building while a voice tells the story of Troyes. Tickets from the Tourist Office. It may not be the capital of Champagne (Epernay has that honour), but there are plenty of vineyards to visit nearby. Check with the Tourist Office. Guide to Visiting Champagne Houses near Troyes and in Reims. Troyes has a good selection of hotels, including two which are located in historic buildings where you feel you have stepped back into the past. Staying in the outskirts is cheaper, but you will have to walk into the historic center for sightseeing and restaurants. If you want to step back in time (but with all the modern comforts you could want), then book here. La Maison de Rhodes is right in the heart of the old town, just by the cathedral but blessedly quiet in the evenings. From the outside it’s a low building of mellow stone with an imposing doorway. Inside, an enclosed courtyard is surrounded by half-timbered buildings with a garden at the end. A wooden staircase takes you up to the second floor buildings on one side of the square. Its foundations date back to the 12th century when it belonged to the Knights Templars of Malta then was used as a convent. Today it’s a stunning 4 star hotel of 11 rooms. Stone-walled, floors of warm red tiles or wood, old furniture, fireplaces and beamed rooms – take your pick as each is different. It should be good, it's owned by Alain DucAnd rest assured – bathrooms are large and luxurious. It now has a modern outdoor swimming pool. Take breakfast (extra) in the delightful restaurant or outside in the peaceful courtyard. Dinner, using local ingredients, ecologically sourced, is served Tuesday to Saturday. Three former houses of the 15th and 16th century make up this charming hotel, hidden away in a cobbled street and right next to La Maison de Rhodes; both are owned by Alain Ducasse. Le Champ des Oiseaux shows a similar meticulous attention to historic detail in the decoration of the rooms where once again you wake up wondering which century you are living in. Rooms vary in size and style and some are in the eaves with timbered vaulted ceilings; bathrooms are spacious and well equipped. This 4-star hotel of 12 rooms is slightly cheaper than La Maison de Rhodes. Tucked away down a small alley but right in the center of the old part (and a hop, skip and jump from the main square), this charming hotel in the former Goldsmiths Street, is family-owned and welcoming. Bedrooms are decorated in a modern style, with fresh colors, pretty fabrics and comfortable beds. Some have balconies which look down onto the action while those on the garden side are quieter. There’s a dining room for breakfast, and a delightful intimate bar. Four half-timbered 12th century houses, once belonging to the Counts of Champagne who minted money here, make up this charming small 2 star hotel in the old town. Rooms are mainly good sized, simply decorated in pretty fabrics and some have fireplaces. Ask for one of the bigger ones to get a decent sized bathroom. You can take breakfast in a room surrounded by suits of armour or there’s a separate lounge. The staff are friendly and knowledgeable, and it makes a good, inexpensive stop. Troyes has a good range of restaurants at all prices. Many of them cluster together in the little streets around the St. Jean Church and are good for a light bite and drinks in the evening. But they get very crowded and you’ll find that standards vary. If you want to eat well, avoid this area and make for the nearby surrounding streets. Troyes’ main claim to fame in the culinary stakes is andouillette (a coarsely cut sausage of pork intestines, wine, onions, salt and pepper). 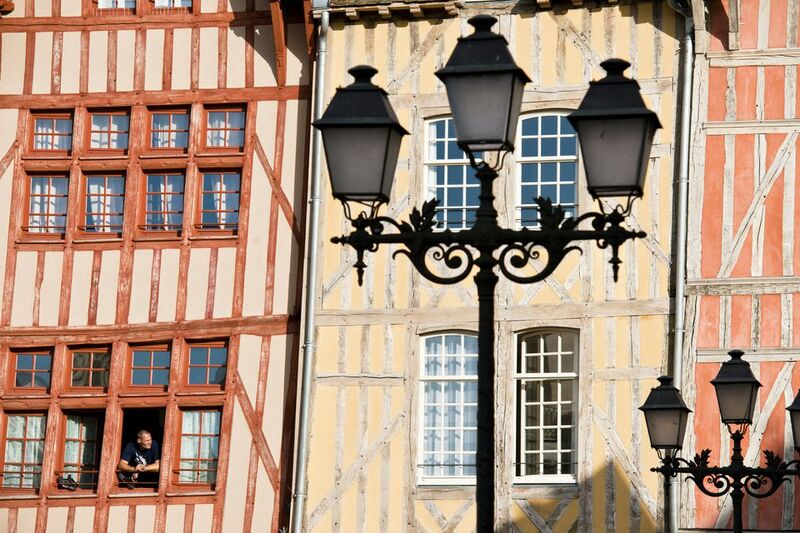 It has made Troyes a gourmet destination for those after a genuine French culinary experience. The andouillette’s origins go back to 877 when Louis II was crowned King of France in Troyes cathedral and the whole town celebrated with a massive andouillette feast. By the end of the 15th century there was a guild of charcutiers dedicated to creating andouillette and, over the centuries it became the thing to sample when passing through Troyes. So if you order it, you’re following in the footsteps of the likes of Louis XIV in 1650 and Napoleon I in 1805. Wherever you taste andouillettes, whether in Troyes, or Nice or Paris, you should make sure that the 'Five A' symbol is marked on the menu beside the dish; it means that it's approved by the Association amicable des amateurs d’andouillette authentique (that is the club of its fans and food critics) formed to protect the standards. The coarse French sausages might not be to your taste; they are two of the dishes in my Disgusting Delicacies in France.